When much of Wall Street collapsed in 2008 as a direct result of their corrupt business model, their pals in Washington used the public purse to resuscitate the same corrupt financial model – allowing even greater depositor concentration at JPMorgan and Bank of America through acquisitions of crippled firms. It has been widely reported that Libor, the interest rate benchmark that was rigged by a banking cartel, impacted $10 trillion in consumer loans. Libor stands for London Interbank Offered Rate and is supposed to be a reliable reflection of the rate at which banks are lending to each other. Based on the average of that rate, after highs and lows are discarded, the Libor index is used as a key index for setting loan rates around the world, including adjustable rate mortgages, credit card payments and student loans here in the U.S. But what’s missing from the debate are the most diabolical parts of the scam: how a rigged Libor rate was used to defraud municipalities across America, inflate bank stock prices, and potentially rig futures markets around the world. All while the top U.S. bank regulator dealt with the problem by fiddling with a memo to the Bank of England. Libor is also one of the leading interest rate benchmarks used to create payment terms on interest rate swaps. Wall Street has convinced Congress that it needs those derivatives to hedge its balance sheet. But look at these statistics. According to the Office of the Comptroller of the Currency, as of March 31, 2012, U.S. banks held $183.7 trillion in interest rate contracts but just four firms represent 93% of total derivative holdings: JPMorgan Chase, Citibank, Bank of America and Goldman Sachs. As of March 31, 2012, there were 7,307 FDIC insured banks in the U.S. according to the FDIC. All of those banks, including the four above, have a total of $13.4 trillion in assets. Why would four banks need to hedge to the tune of 13 times all assets held in all 7,307 banks in the U.S.? 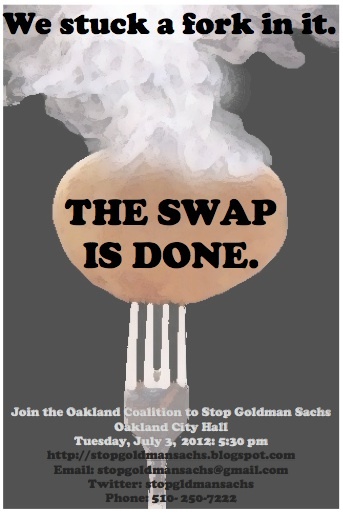 The answer is that most swaps are not being used as a hedge. They are being used as a money-making racket for Wall Street. Rigging Libor also inflated the value of the trash that Wall Street was parking in 2008 and 2009 at the Federal Reserve Bank of New York to extract trillions in cash at near zero interest-rate loans from the public purse. When rates rise, bond prices decline. When rates decline, bond prices rise. The Federal Reserve made loans to Wall Street based on a percentage of the face value of their bonds and mortgage backed securities that they presented for collateral. By pushing down interest rates, the banks were getting a lift out of their collateral, allowing them to borrow more. The banks that cheated on Libor were also perpetrating a public fraud in terms of how the market perceived their risk. The Libor rate they each reported every morning to compile the index was based on the rate they would pay to borrow from other banks, thus the name London Interbank Offered Rate or Libor. So, for example, even though Citibank’s credit default swap prices were rising dramatically during the 2008 crisis, suggesting it was in trouble, it was reporting low borrowing costs to the Libor index. In simple terms, Wall Street and its colleagues in the global banking cartel have left us clueless as a nation about the validity of our markets, how much hidden debt liability our local and state governments really have, and where the stock market would actually be if interest rates had not been rigged. Let’s explore the almost incomprehensible rip off of our now struggling communities. Here’s how the swap deals typically worked, although there were Byzantine variations called constant maturity swaps (CMS), swaptions, and snowballs. These complex machinations pitted the brains of county treasurers or school boards against the deceptive wizards of Wall Street. Municipalities typically entered into an interest rate swap because Wall Street’s fast talking salesmen showed up with incomprehensible power point slides wearing $3,000 suits and assured municipal officials it would lower their overall borrowing costs on their municipal bond issues. A typical deal involved the municipality issuing variable rate municipal bonds and simultaneously signing a contract (interest rate swap) with a Wall Street bank that locked it into paying the bank a fixed rate while it received from the bank a floating interest rate tied to one of two indices. One index, Libor, was operated by an international bankers’ trade group, the British Bankers Association. The other index, SIFMA, was operated by a Wall Street trade association. Neither was an independent monitor for the public interest. When the two sets of cash flows are calculated, the side that generates the larger payments receives the difference between the sums. In many cases, continuing to this day, the municipality ended up receiving a fraction of one percent, while contractually bound to pay Wall Street firms as much as 3 to 6 percent in a fixed rate for twenty years or longer. If the local or state governments or school boards wanted out of the deal, a multi-million dollar penalty fee could be charged based on the rate structure and notional (face amount) of the swap. We learned late last month that the Libor rate the municipalities were receiving was manipulated downward from at least 2007 to 2010 by a global banking cartel. The U.S. dollar Libor panel included U.S. banks JPMorgan Chase, Citibank (whose parent is the former ward of the taxpayer, Citigroup), and Bank of America. Canadian prosecutors have implicated JPMorgan and Citibank in a criminal probe, as well as other banks. A whistleblower has provided the names of traders that are alleged to have taken part in the scheme and turned over emails, according to affidavits filed with the Ontario Superior Court. At least 12 global banks are being investigated by U.S., British and European authorities. Barclays admitted in June that its employees rigged Libor rates. It paid $453 million in fines to U.S. and British authorities and turned over emails showing its traders and those at other, as yet unnamed, banks gave instructions on how the rates were to be rigged on specific dates. Notice that the words “Wall Street” do not appear in this description and yet, that is precisely what SIFMA is: a Wall Street trade association that viciously lobbies for Wall Street. (As for “supporting investors,” it should be sued for false advertising.) In February of this year, it even sued the top regulator of derivatives, the Commodity Futures Trading Commission in Federal Court to stop it from setting limits on the maximum size of derivative bets that can be taken in the market. From 2000 through 2011, SIFMA spent $96.4 million lobbying Congress on behalf of Wall Street. In the 2008 election cycle, according to the Center for Responsive Politics, SIFMA spent $865,000 in political donations, giving to both Republicans and Democrats. In March 2010, the Service Employees International Union (SEIU) issued a report indicating that from 2006 through early 2008 banks are estimated to have collected as much as $28 billion in termination fees from state and local governments who were desperate to exit the abusive interest rate swaps. That amount does not include the ongoing outsized interest payments that were and are being paid. Experts believe that billions of abusive swaps may be as yet unacknowledged by embarrassed municipalities. In 2009, the Auditor General of Pennsylvania, Jack Wagner, found that 626 swaps were done in Pennsylvania between October 2003 and June 2009, covering $14.9 billion in municipal bonds. That encompassed 107 of Pennsylvania’s 500 school districts and 86 other local governments. The swaps were sold to the municipalities by Citibank, Goldman Sachs, JPMorgan and Morgan Stanley. In one case cited by Wagner, the Bethlehem Area School entered into 13 different swaps, covering $272.9 million in debt for school construction projects. Two swaps which had concluded at the time of Wagner’s investigation cost taxpayers $10.2 million more than if the district had issued a standard fixed-rate bond or note and $15.5 million more than if the district had simply paid the interest on the variable-rate note without any swaps at all. And therein lies the rub. Municipalities never needed these nonsensical weapons of mass deception. Muni bond issuers could have simply done what muni investors have done for a century – laddered their bonds. To hedge risk, an issuer simply has bonds maturing along a short, intermediate and long-term yield curve. If rates rise, they are hedged with the intermediate and long term bonds. If rates fall, the short munis will mature and can be rolled over into the lower interest rate environment. Municipal issuers are further protected by being able to establish call dates of typically 5 years, 7 years, or 10 years when they issue long terms bonds. They pay moms and pops and seniors across America, who buy these muni bonds, a small premium of usually $10 to $20 per thousand face amount and call in the bonds if the interest rate environment becomes more attractive for issuance of new bonds. The Mayor of Baltimore, the Baltimore City Council, the City of New Britain Firefighters’ and Police Benefit Fund of Connecticut have filed a class action lawsuit in Federal Court in New York over the rigging of Libor. The plaintiffs state that the City of Baltimore purchased hundreds of millions of dollars of derivatives tied to Libor while the New Britain Firefighters and Police Benefit Fund purchased tens of millions. They are suing the banks involved in submitting the Libor rates. Wall Street’s boot on interest rate swaps dates back at least 17 years. In February 1995, Smith Barney (now co-owned by Citigroup and Morgan Stanley) fired Michael Lissack as a managing director in the firm’s public finance department after he publicly accused the firm of cheating Dade County, Florida out of millions on an interest rate swap. Lissack went on to become the scourge of Wall Street by expertly detailing how counties and states were being ripped off by Wall Street. He even set up this amusing web site to do battle with the firm. The case became known as the “yield burning case,” an esoteric term that the public could hardly fathom, much like the Libor scandal today. In 2000, the Securities and Exchange Commission settled the yield burning matter with 21 firms and imposed fines of $172 million, a minor slap on the wrist given the profits of the firms. Arthur Levitt was Chairman of the SEC at the time and came from the ranks of Wall Street. Which brings us full circle. If you’ve ever wondered where all of those revolving doors between Wall Street and Washington would eventually lead us, we’ve just found out. It leads to the regulators becoming just as jaded and compromised as Wall Street. While Wall Street banks and their global counterparts were grabbing the loot, their regulator was watching carefully behind the wheel of the getaway car for at least four years. This past Friday, the Federal Reserve Bank of New York turned over emails and documents showing that Timothy Geithner, the sitting U.S. Treasury Secretary of the United States, knew at least as early as 2008 that Libor was being rigged. At the time, Geithner was the President and CEO of the Federal Reserve Bank of New York – the top regulator of Wall Street’s largest banks. As far as we know currently, Geithner did nothing more to stop the practice than send an email with recommendations to Mervyn King, Governor of the Bank of England. Libor rigging continued through at least 2010. As the U.S. grapples with intractable wealth disparity and the related ills of unemployment and recession, we need to understand that this was not merely a few rascals rigging some esoteric index in London. This was an institutionalized wealth transfer system on an almost unimaginable scale.